Dr. Campbell started her dental career as an assistant in an orthodontist office at the age of 16. She went on to receive her Bachelors and Doctorate degree from the University of Detroit Mercy in 2005. Dr Campbell and I worked together for 3 wonderful years. She is one of the most compassionate dentists I have had the privilege to know. Dr Campbell has very good eye for esthetics a quality which is exemplified in her dentistry, especially her Cosmetic Dentistry. 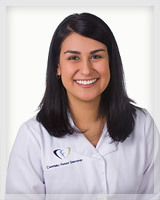 Dr. Campbell works very hard to put the care of her patients foremost in her practice. From her dedication to continuing education to her commitment to technology and the best techniques, her patients receive high quality care at each appointment. She has certainly earned her reputation as an excellent dentist. Vanessa is an excellent and caring dentist.